ALBA Berlin (BBL) landed 24-year old Cameroonian international center Landry Nnoko (208-114kg-94, college: Clemson). He already started the season at Sakarya Buyuksehir Basketbol in Turkish BSL league. Nnoko managed to play in three leagues this year (!!!). In 6 BSL games he averaged impressive 17.5ppg, 9.3rpg, 1.2apg and 1.2bpg. Nnoko also played 6 games in FIBA Europe Cup where he had 14.5ppg, 9.2rpg and 3.5apg. And finally he contributed to 2 games in Basketball Champions League where he recorded 9.5ppg, 11.0rpg, 1.5apg and 1.0bpg. Nnoko has tried to make it to the NBA and played in the NBA Pro Summer League in 2016. 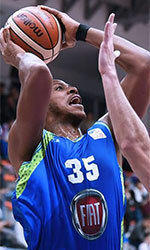 He received USBasket.com All-NBA G League Defensive Player of the Year award in 2018. Nnoko has been regularly called to Cameroonian Senior National Team since 2015. He has played also professionally in Italy (VL Pesaro), NBA (Detroit Pistons and Miami Heat) and NBA G League (Grand Rapids Drive). Nnoko attended Clemson University until 2016 and it is his third season in pro basketball.